Below is a short history of the unit. For a more detailed, extensive version download the pdf file titled: History of the 3rd Iowa Light Field Artilley. For a complete roster of the battery with soldier name, company, age, home, birthplace, and short annotation of his career click here. The 3rd Iowa Battery was organized under special authority from the Secretary of War, during the months of August and September, 1861, at Dubuque, Iowa, under the name of the Dubuque Battery, and was attached to the Ninth Regiment Iowa Volunteer Infantry, Col. William Vandever commanding, while it remained in rendezvous and for some time after taking the field. On September 3, 1861, the first detachment of the battery, with William H. McClure as First Lieutenant, was mustered into the service of the United States and went into quarters at Camp Union, near Dubuque. 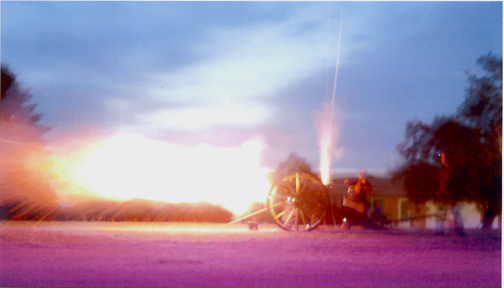 The necessary additional enlistments -- to complete the organization of a full battery of artillery-- were soon secured and on September 24, 1861, the muster in of the battery was completed. The names of the commissioned officers appear upon the original roster, as follows: 1 Captain, Mortimer M. Hayden; Senior First lieutenant, William H. McClure; Junior First Lieutenant, Melville C. Wright; Senior Second Lieutenant, William H. Crozier, and Junior Second Lieutenant, Jerome Bradley. The roster shows that, upon completion of its muster, the battery numbered 140 men, rank and file. The Battery, with the Ninth Iowa Infantry, left Camp Union on September 26, 1861, and embarking on the steamer " Canada ", was conveyed to St. Louis , arriving there on the 30th, and going into quarters at Benton Barracks, near that city. There, uniforms and horses were provided for the battery, but its equipment was not completed until two months later, owing to the difficulty of procuring guns and the other articles necessary to place the battery in condition to take the field for active service. In the meantime, only such instruction could be given as related to the rudiments of artillery drill, and discipline. On November 13, 1861, the company was ordered to proceed to Pacific City, Mo., 35 miles west of St. Louis, where it remained until near the last of January, 1862. 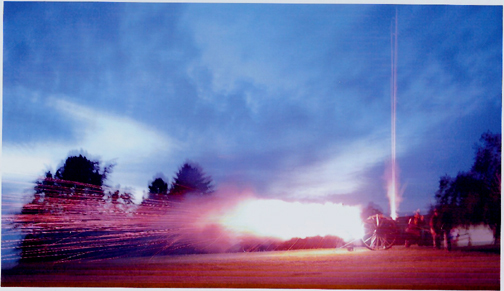 About the first of December it received its armament of six guns -- four six pounder bronze guns and two twelve pounder howitzers -- and the other requisite equipage appertaining to a field battery. The officers and men at once began to drill, and, by the time they were ordered to take the field, had become quite proficient in handling the guns. 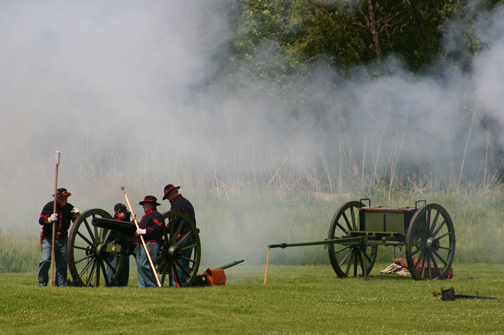 The battery was several times reviewed and inspected and, in connection with the Ninth Iowa Infantry, went through the movements that might be required when engaged in conflict with the enemy. The inspecting officers reported that it was in condition to take the field and to render good service, and on Jan 25, 1862, Captain Hayden was ordered to proceed with the battery to Rolla, Mo., to which place it was conveyed by rail and, upon its arrival there, joined the army under command of Major General, Curtis, then about to begin an aggressive campaign against the enemy. Early on the morning of Feb 14th, the army took up its line of march in pursuit of the retreating army. At Flat Creek, fifty miles from Springfield, the Third Iowa Battery fired its shot at the enemy. Its brigade leading the advance of the army, and coming within long range of the enemy's rear guard, the battery opened fire, but, after firing a few shots, the rebels got out of range. The pursuit was continued and the army crossed the Missouri line and reached Sugar Creek, in Arkansas, where the rear guard of the rebel army was again encountered by the cavalry which had advanced some distance beyond the Union Infantry. After a brief engagement--in which the cavalry sustained considerable loss--Vandever's Brigade was ordered to move forward, and the Third Iowa Battery was soon engaged with a rebel battery in its front. 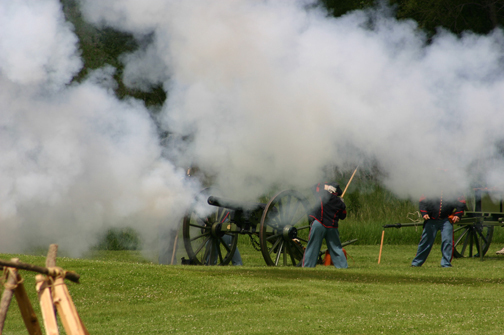 The gunners of the battery delivered their fire so accurately that, in less than thirty minutes, they had silenced the fire of the rebel battery, and it had limbered up and was galloping of the field, the rest of the rebel force also retreating before the advance of Vandever's Brigade. There were no casualties among the officers and men of the battery in this affair, but it lost two horses killed and had one caisson disabled by the enemy's fire. 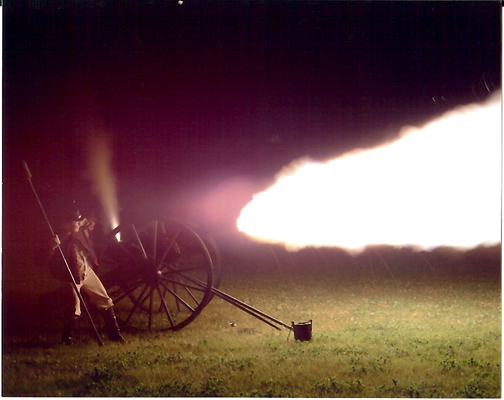 General Curtis complimented the battery for the skillful management of its guns. COLONEL: Hearwith please find statement of the part taken by this command, in the actions of the 7th and 8th instant: Pursuant to your order I sent forward one section of the battery, in charge of Lieutenant M.C. Wright, who took position in the road directly in from of and under a heavy fire from the enemy's battery. Lieutenants W.H. McClure and J. Bradley, with their respective sections, were ordered forward to engage the enemy on the right and left of the first section. Supported by the Ninth Iowa Infantry, we held this position until the rebel guns had disabled ten pieces and killed and wounded many of the men and horses. The engagement became general along the whole line, with both artillery and infantry. The enemy's fire becoming too severe, we withdrew, leaving behind our disabled limber and several killed and wounded horses. 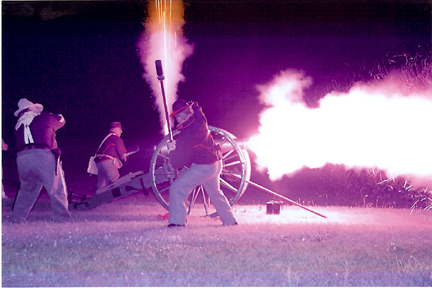 We then took position about three hundred yards in rear of the point where our fire was first opened, remaining there until near evening, (having held the enemy in check during the entire day,) at which time the whole division fell back to a large open field, where it halted during the night. Here the enemy pursued, but, being vigorously engaged by our artillery and infantry, was driven back with severe loss. During the engagement we attempted to plant the pieces of the battery upon a commanding eminence, but failed in the endeavor, an immense force of the enemy's infantry charging upon us, carrying away one of my guns, and killing and wounding two of my own, and several of the battery horses. On the morning of the 8th we took position on the enemy's left, unsupported by either infantry of cavalry, opening fire on the slope where our guns were captured the previous day. Shortly afterwards the enemy opened upon us from a battery in our front, to which we then turned our fire, silencing his guns and driving him from the field. Our loss is two men killed and seventeen wounded. We lost twenty-three horses killed and three disabled. Three of our guns and one limber were captured by the enemy. I desire to make mention of the coolness and bravery of the whole command during the entire engagement, especially of Lieutenants Wright and Bradley, who, fearless of all personal danger, met the enemy with a spirit worthy of the highest commendation, and cannot overlook the efficient services rendered by Sergeants House, Harkins and Weaver, alike of Corporals Martin, Guilford, Goldthorp and Rowls. The latter, while spiking the last gun, left upon the field, was severely wounded in both legs. Captain M. M. Hayden was its first commander and served until October 3, 1864, when he was mustered out, being succeeded by Lieutenant Melville C. Wright who served until January 5, 1865, when he in turn was succeeded by Lieutenant O. H. Lyon. This battery took an active part in the battles of Pea Ridge and Helena as well as several engagements in other parts of Arkansas. Its losses during the war were four killed, thirteen wounded, thirty-three deaths from disease and twenty discharged for disability. This battery was mustered out of the service on the 3d of October, 1865, at Davenport.